This 4-Port USB Hub bridges the gap between your computer and older USB technology devices. Expand a single USB-C port to connect and charge a smartphone and tablet, digital camera and peripherals such as a printer, external hard drive and much more. With the USB 3.1 Gen 2 specification, this compact hub delivers lightening-fast connectivity and file transfer capabilities. Transfer high bandwidth data like large files, photos, and video at 10Gbps speeds. 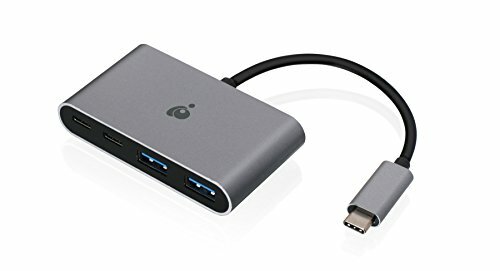 Immediately expand your desktop or laptop's USB-C port to accommodate up to two USB Type-A 3.0 devices while supporting older USB 2.0 and USB 1.1 legacy peripherals like a keyboard, mouse, printer, or external hard drive. Don't need the expansion port? Connect your smartphone or tablet to the ports to charge up and transfer data. Never worry about running out of power while using the IOGEAR USB-C 10G 4-Port Hub. Plug your laptop's original USB-C AC charger to the USB-C port to provide up to 100W of power delivery.1 Use the USB-C port to plug in and transfer data when not charging your laptop. Connect and charge USB devices through the rapid charging BC 1.2 (1.5A) USB Type-A port or the second USB Type-A port with 0.9A of charging power. 1Hub delivers up to 85W of direct charging power to a connected laptop while the hub utilizes up to 15W for the system and charging connected devices. Fast Role Swap is an advanced feature in the USB Power Delivery 3.0 specification which ensures the docking station will maintain power anytime it drops below a set threshold such as while unplugging the USB-C power adapter from the dock or during an unexpected loss of building power. This feature provides a smooth, safer operation of connected devices, so your work does not get interrupted.